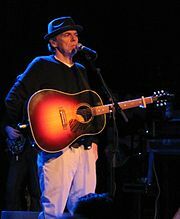 John Robert Hiatt (born August 20, 1952) is an American singer-songwriter and musician. He has played a variety of musical styles on his albums, including new wave, blues, and country. Hiatt has been nominated for nine Grammy Awards and has been awarded a variety of other distinctions in the music industry. He remains one of the most respected and influential American singer-songwriters. Hiatt was working as a songwriter for Tree International, a record label in Nashville, when his song "Sure As I'm Sittin' Here" was covered by Three Dog Night. The song became a Top 40 hit, earning Hiatt a recording contract with Epic Records. Since then he has released 22 studio albums, two compilation albums and one live album. A variety of artists in multiple genres have covered his songs, including Aaron Neville, B.B. King, Bob Dylan, Bonnie Raitt, Buddy Guy, Chaka Khan, Dave Edmunds, Delbert McClinton, Desert Rose Band, Emmylou Harris, Eric Clapton, Iggy Pop, I'm with Her, Jeff Healey, Jewel, Jimmy Buffett, Joan Baez, Joe Bonamassa, Joe Cocker, Keith Urban, Linda Ronstadt, Mandy Moore, Maria Muldaur, Nick Lowe, Paula Abdul, Paulini, Rodney Crowell, Rosanne Cash, Ry Cooder, Suzy Bogguss, The Nitty Gritty Dirt Band, The Searchers, Three Dog Night, Willie Nelson, Asleep at the Wheel, and Willy DeVille. The Dutch singer/songwriter Ilse DeLange recorded the album Dear John with nine of his songs. He moved to Nashville, Tennessee, when he was 18 years old and got a job as a songwriter for the Tree-Music Publishing Company for $25 a week. Hiatt, who was unable to read or write scores, had to record all 250 songs he wrote for the company. He also began playing with the band White Duck, as one of three singer-songwriters within the group. White Duck had already recorded one album before Hiatt joined. He wrote and performed two songs on their second album, In Season, one of which was the hit "Train to Birmingham" (1972). Hiatt performed live in many clubs around Nashville with White Duck and as a solo act. Hiatt was picked up by the MCA label in 1979. He released two albums for the label – Slug Line (1979) and Two Bit Monsters (1980) – neither of which met with commercial success. He received a few good reviews for these albums by critics in the Netherlands. He performed at Paradiso in Amsterdam for the first time in 1979 (opening for Southside Johnny & The Asbury Jukes) and came back often and built a solid fan base. In 1982, "Across the Borderline", written by Hiatt with Ry Cooder and Jim Dickinson, appeared on the soundtrack to the motion picture "The Border", sung by country star Freddy Fender. The song would later be covered on albums by Willie Nelson, Paul Young, Rubén Blades and Willy DeVille, among others, as well as by Bruce Springsteen and Bob Dylan in concert. Hiatt was signed to Geffen (which would later absorb MCA) in 1982, where he recorded three diverse albums from 1982 to 1985. The first, All of a Sudden, was produced by Tony Visconti, and featured use of keyboards and synthesizers; his future albums combined country and soul influences. Riding With the King appeared in 1983, produced by Scott Mathews, Ron Nagle and Nick Lowe. Hiatt began making "critics choice" lists and building a large European following. The title track of Riding With the King (taken from an odd dream Scott Mathews had) was re-recorded two decades later by Eric Clapton and B.B. King and went double platinum. During this period, Rosanne Cash covered several Hiatt compositions, taking "It Hasn't Happened Yet" to the Top 20 on the country charts. In 1983, Cash would duet with Hiatt on his "The Way We Make a Broken Heart" produced by Mathews and Nagle. When Geffen failed to release the single, Cash re-recorded it in 1987 and it went to No. 1 on the US country charts. It was during this time that Asleep At The Wheel also covered the song. Ricky Nelson also covered "It Hasn't Happened Yet" on his 1981 album Playing to Win. On February 12, 2008, during a concert with Lyle Lovett at the National Arts Centre in Ottawa, Ontario, Canada, Hiatt said that his new album would be titled Same Old Man. It was released on May 27, 2008. On July 15, 2014, Hiatt released Terms of My Surrender, his 22nd studio album. It earned Hiatt two Grammy nominations. On October 12, 2018 Hiatt released The Eclipse Sessions, an LP via New West Records. The album, his first in four years, was recorded over four days in the summer of 2017, a period that included the August 21st solar eclipse. Hiatt recorded the album as part of a trio of guitar, bass (Patrick O’Hearn), and drums (Kenneth Blevins). Hiatt has a step-son, Robert, two daughters, singer-songwriter Lilly Hiatt, and Georgia Rae Hiatt. ^ a b c d e f g h i j k l m n Strong, Martin C. (2000). The Great Rock Discography (5th ed.). Edinburgh: Mojo Books. pp. 446–447. ISBN 1-84195-017-3. 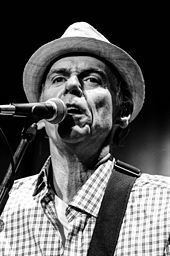 ^ "John Hiatt". GRAMMY.com. 2018-05-22. Retrieved 2018-08-31. ^ "John Hiatt". Amazon.com. 2007-04-22. Retrieved 2012-04-10. ^ "Rocker John Hiatt: As Good As His Words – New York Times". Nytimes.com. 1989-03-12. Retrieved 2014-07-10. ^ a b "Rolling Stone Online: John Hiatt Interview". Unicom.com. 1997-06-29. Retrieved 2014-07-10. ^ Hopkins, Renee (March 3, 1994). "Joys of Bust-'em-up Rock". The Dallas Morning News. ^ Walker, Dave (May 29, 2011). "'Treme' explained: 'Feels Like Rain'". The Times-Picayune. ^ Steinberg, Jacques (19 October 2008). "The Lyrics? Pretty Familiar. The Performer? Less So". The New York Times. Retrieved 19 July 2018. ^ Margasak, Peter (3 October 2017). "Lilly Hiatt brings her keen observational powers to a breakup on the new Trinity Lane". Chicago Reader.